The well known Lisbon Coast or “Costa de Lisboa” offers certainly one of the most diversified landscapes of Portugal`s coast line. Following the Northern part the region starts at the metropolis passing through the well known towns like Oeiras, Estoril, Cascais, Sintra, Mafra, Ericeira, Santa Cruz going until Lourinha and going South the Lisbon Coast stretch until Setubal. None of these places should be missed during your visit as each town has its particularity and its very special flair. The beauty of the coastline is breathtaking with its splendid variety of beaches, towns, fisher villages and resorts and is certainly very captivating due to its cosmopolitan flair, the abundance of historical sites, the diversified gastronomy, the incredible nightlife, the huge offer of golf courts and golf resorts and the never ending shopping possibilities. 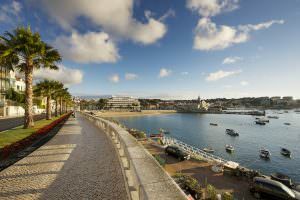 The large choice of luxury hotels and the sophisticated seaside resort “Estoril” with its Casino welcomes the entire year round the worldwide tourism. The region is also very popular for surfers, wind surfers, deep sea fishing trips and feature cruises. Definitely a place where you can stay for a while or for your entire life.